**PLEASE NOTE, MOST OF MY NEW STOCK IS DISPLAYED IN MY EBAY SHOP AT THIS PRESENT TIME. Our aim here at DELRIUM is to offer some of the best value & affordable Art Deco Lamps on the Web.We have a great passion for Art Deco lamps & would dearly like to keep them all! But its only fair to allow others the pleasure of these objects of beauty & desire. We specialise mainly in Art Deco Table lamps & Desk lamps typically from the 20s & 30s. That Golden age of those swinging Deco Days. All our lamps are geniune & from the Deco period. They are all fully refurbished where nesscesary to bring them back to life.Also fully rewired & earthed to BSI standards.Supplied with the plug disconnected to conform to the regulations of the sale of secondhand electrical goods. These lamps are equally at home in a Modern, Contemporary or Deco setting, & make a wonderful statement, eminating a real Deco Aura. 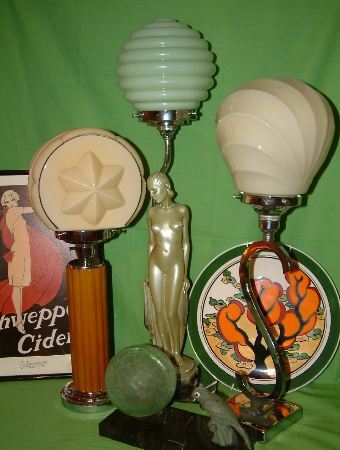 These Art Deco lamps belong to the world of luxury & decadence, the golden age of the 20s & 30s. The very term conjures up a multitude of romantic images; Huge Ocean Liners gliding effortlessly across moonlight seas;The sounds of clicking cocktail glasses & a racous Jazz Band eminating from a sumptuously decorated Ballroom.